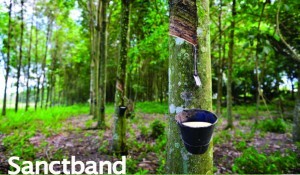 Sanctband Exercise Bands & Tubing are made from Natural Rubber Latex which is tapped from hevea brasiliensis rubber trees. 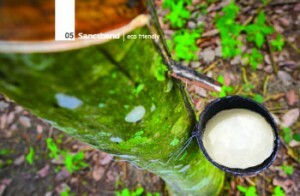 As such, Natural Rubber is an environmental friendly & renewable resource. Studies show that rubber trees planted worldwide can remove 363,000 tonnes of carbon dioxide annually, replacing it with 264,000 tonnes of oxygen through photosynthesis. Backed by more than 75 years of scientific research in Malaysia, the rubber tree of the hevea brasiliensis species has been bred to the most efficient source of rubber latex. It is planted with a density of 450 trees per hectare. At the end of each lifecycle of 30 years, the trees are felled for timber and the area replanted. Tests by the RRIM (Rubber Research Institute of Malaysia) show that latex products disposed in landfill biodegrade after 2 weeks achieve a weight loss of 75% without impairment to the environment. (Source from MREPC’s Promotion Brochure).